What are the on-peak cooling costs in your area? They are probably several times the off-peak rates. Using the widely accepted Thermal Energy Storage technology can easily reduce your cooling costs and you’re still going to get the desired results. It is evident that people are picking up on this —energy storage installations are sprouting up across the globe. Recently, IHS, a research firm based in Colorado, reported that the installation rate for commercial energy storage is likely to hit the 6GW annual rate by 2017. Without doubt, Thermal Energy Storage is at the center of this evolution. The obvious benefit of this technology is that firms will be able to reduce the size of their equipment and lower costs. So, is it time for you to evaluate the benefits of using Thermal Energy Storage during peak hours? Consider the following four benefits and see if they fit into your current situation. Yes, electricity rates can be confusing sometimes, but you might want to study your bill more closely. If possible, check utility bills for other commercial buildings nearby. Even if you do not decipher anything at first glance, consider getting a consultant to help. You will be surprised to find that the rates can be as much as 60 % cheaper during the night. The amount you pay for cooling your facility during a hot summer day can be several times what it would cost you for the same at night. What would you say about making $100 savings for every kilowatt of peak demand? With Thermal Energy Storage, you can reduce the cooling costs in your hospital or factory by thousands of dollars. Does LEED certification motivate you? Installing a Thermal Energy Storage Tank is one of the best ways of garnering the credits. The tank is definitely more about reducing demand for power during peak hours than reducing total consumption, but it does contribute to making the environment greener. Many studies have shown that generating electricity during off peak hours minimizes the consumption of fossil fuels. The report The Costs and Financial benefits of Green Buildings, delivered by California’s Sustainable Building Taskforce in 2003, reiterates that off-peak power is cleaner than peak power. Most chillers last for about two decades. If you have an aging chiller, then you can consider a Thermal Energy Storage installation during replacement. Have your cooling needs increased over the years and is your equipment apparently overwhelmed? You have a reliable solution in a Thermal Energy Storage system. When the efficiency of your chiller declines and no level of maintenance can remedy the situation, the replacement does not have to be as big. With Araner thermal storage tanks, you are able to shift the peak energy to off-peak hours, thereby downsizing your equipment. If your cooling plant is unable to cater for the growing cooling needs, you can still retrofit the tank. Finally, a thermal energy storage tank can also double as a source of fire protection. Remember that these tanks are perpetually full of water, which is a perfect way to prepare for a fire. In case you want your tank to serve this purpose, you can talk to designers at Araner and consider the safety solution that can also be offered. There are also cases of fire protection tanks being retrofitted as thermal energy storage tanks, so there is some flexibility here. More energy solutions are being added to the grid and peak demand is increasing. The need for energy storage is now more of a necessity than a choice. We are looking forward to a future whereby large commercial buildings will be key of saving money for the economy as a whole. Therefore, it is important to determine whether your facility needs thermal energy storage. This will involve an analysis of the existing equipment, building type and available space. It should not be forgotten that this is a decision that will require some serious evaluation. 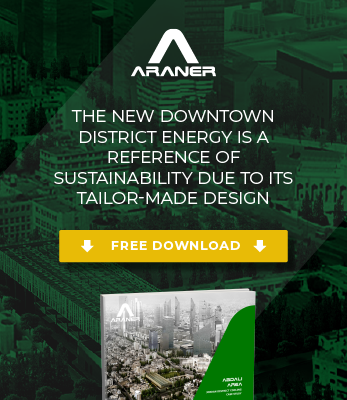 This is why ARANER offers a comprehensive engineered-based service. Our compromise is with the best solution for our clients. In Thermal Energy Storage Tanks we make the most out of our engineering design expertise, achieving a reduction of the installation’s footprint. At ARANER we accompany the client from the design, to the manufacture and installation of tailor-made energy solutions. Download our Thermal Energy Storage Reference Book and get all the information about our work and solutions.